A nature lover and adventurer’s paradise, Bonaire is the ultimate ecotourism destination and a perfect playground for all your exploration needs, both on the land and in the sea. Whether you fancy a hike, a swim, or a tour on a bike, explore the island’s many protected parks and wetlands and discover the fascinating fauna and colourful flora that compose its beautiful wildlife. Visit the many sanctuaries and lagoons for a sight of the island’s protected species, immerse yourself in the local heritage by taking a trip to the old slave huts, the distillery, or the salt pans, or add a touch of adrenaline to your exploration with some caving, rappelling, rock climbing, diving, or one of the many water sports available around the island. The island is home to some wetlands with great international importance, such as Lac, Pekelmeer, Klein Bonaire, Gotomeer and Slagbaai Lagoon, which are the only sites in the Dutch Caribbean to be protected by the Ramsar Convention. 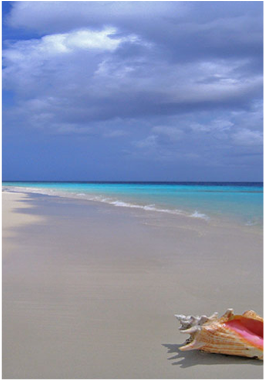 The Dutch Caribbean’s largest bay is not only protected by the Ramsar Convention, a feeding site for green sea turtles and a nursery for reef fish, it is also an important resting and nesting site for numerous species of birds and marine invertebrates, such as the endangered Queen Conch. Nature lovers will enjoy the diversity of landscapes offered by the island, composed by both native and imported flora species. 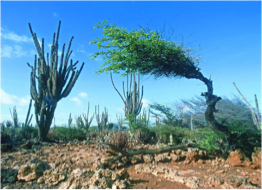 The northeastern end of the island presents a desert-like background made of cacti (prickly pear, candle), and trees such as the divi divi, calabash, Brasilwood, and mesquite acacia. Famous for putting nature first, Bonaire is also renowned for its unspoilt diving sites, resulting from the island’s efforts to conserve its beautiful wildlife. In 2012, the island’s council granted permission to the Coral Restoration Foundation (CRF) to develop a coral nursery and reef restoration project, aiming to restore damaged parts of the reef, particularly in the shallow waters that are home to the elkhorn and staghorn corals. Alongside Bonaire’s free-roaming goats and donkeys, hikers are likely to come across iguanas, many species of lizards, and some land snails. The island is also home to no less than eight species of bats and 203 species of birds, including the colourful Flamingo, Orioles, Bananaquits, and Trupials, as wells as Bonaire’s very own Lora (yellow-shouldered parrot) and green Prikichis. 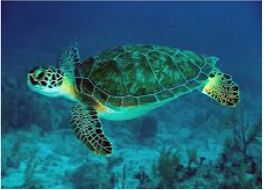 Founded in 1991, the Sea Turtle Conservation Bonaire (STCB) aims to protect the endangered turtle species living on the island, such as the hawksbill, loggerhead, and green turtle. Whilst loggerhead turtles visit the island mainly through their nesting season, the hawksbill and green turtles can be spotted on the island year-round. With its crystal-clear waters, healthy marine life and protected sites, it is no wonder that Bonaire is such a popular destination amongst divers and snorkelers. Counting 86 stunning sites, more than 350 fish species, and 57 species of soft and hard coral, the island’s marine landscapes never fail to impress and keep on attracting visitors year after year. 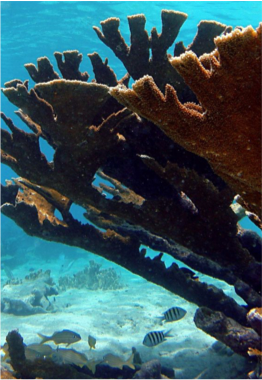 With a depth of 30 to 100 feet (10 to 30 metres), this reef is famous for boasting the Caribbean’s largest diversity of marine life, counting over 300 species. 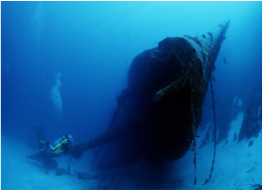 Located near the beginning of the island’s double reef system, this world-famous site features a 1984 wreck with its top lying at 60 feet and its mast at 99 feet. With a depth ranging from 25 to 100 feet (8 to 30 metres), this dive offers great examples of coral development on an artificial site, and gives an idea of the necessary time for storm-damaged hard coral to redevelop. Taking its name from the No Name beach it lies across from, this site is one of Klein Bonaire’s most popular dives, with a beach that attracts many of the daily visitors arriving by water taxis. With a depth of 30 to 100 feet (10 to 30 metres), the site is home to yellowhead jawfish and blackish sail fin blennies. 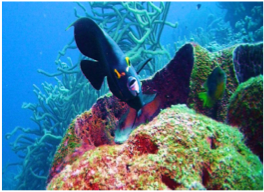 Located North off 1000 steps, this sites features a long stretch of coral beach and is home to angel and schooling fish. Ranging from 20 to 80 feet deep (6 to 25 metres), occasional passing whale sharks can be spotted there. The sponges and coral encrusted pillars of this pier offer a great diving opportunity for both beginners and photographers, with a depth ranging from 15 to 50 feet (5 to 15 metres). Located just off Lac Bay, this site is often referred to as East coast diving and is home to species such as tarpons, turtles, rays, and sometimes sharks. Ranging from 15 to 100 feet deep (5 to 30 metres). With a depth ranging from 30 to 100 feet (10 to 30 metres), this site offers a stunning opportunity to experience a double reef. 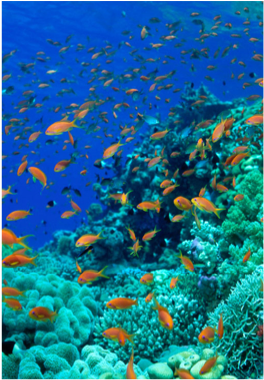 Divers are advised to take care of their depth gauge when going from one reef to the other. 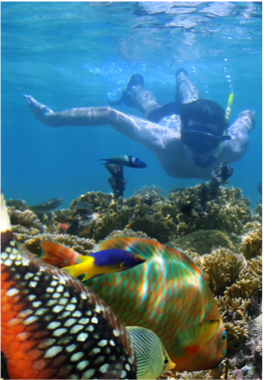 An ideal site for beginner snorkelers and divers, you will find this site located half a mile north of the destination plant. With a depth ranging from 20 to 100 feet (6 to 30 metres), expect to encounters the likes of parrotfish (rainbow, midnight, and blue parrot fish), seahorses, as well as soft corals and anemones. Named after the lone tree that stands on the shore, the site is home to colonies of seahorses and staghorn corals and ranges from 15 to 100 feet (5 to 30 metres). Found in the Washington Slagbaai National Park, this site features horse-eye jacks and is filled with small fish species. Depth ranging from 15 to 100 feet (4 to 30 metres). Home to many of the island’s larger fish species, this site will also delight experienced divers with some of Bonaire’s most pristine coral. Ranging from 15 to 100 feet (5 to 30 metres), Nukove is found to the West of Washington - Slagbaai. Experienced divers will enjoy the colonies of horse-eye jacks and turtles, as well as schooling baitfish and big-eyed scad chased by larger predators. The site is located off the second set of slave huts and has a depth ranging from 20 to 80 feet (6 to 25 metres). 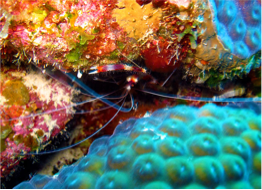 On the northwestern side of Bonaire, this relatively new site is found within the Washington Slagbaai National Park. Look out for larger marine life species which are often spotted in the area. Depth ranging from 30 to 100 feet (10 to 30 metres). Named after the 64 steps that lead shore divers from the road down to the beach and that seem more like a thousand steps on the way back up, the site presents some outstanding star coral formations, starting from right under the boat mooring point, and which are home to a variety of reef wildlife. 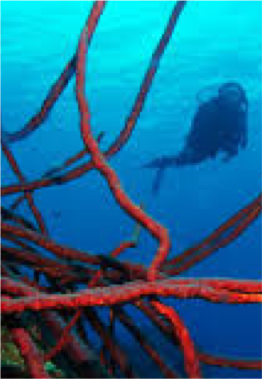 This site takes its name from the large colonies of fern-like black coral that can be found in its waters, alongside the flourishing gorgonians. Divers will come across a cave at a depth of 75 feet where green morays, nurse shark, and loggerhead turtles have been spotted in the past. On the West side of Klein Bonaire, this site features shallow terraces composed of sand and coral, and which are home to burrowing creatures such as sand tilefish and yellow head jawfish, whilst its deeper waters display formations of coral on drop-offs as well as gorgonians. Depth ranging from 30 to 100 feet (10 to 30 metres). 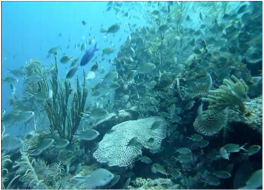 Located on the southwestern coast of the island, opposite the salt works’ outflow, this reef is regarded as the Caribbean’s second best site for fish diversity. Accessible from the shore via a channel passing under the road and opening out on the reef, divers will also come across stands of elkhorn and fire coral, where rare fish and eels tend to hide. This site takes its name from the fact that it was originally proposed as a location for the island’s oil storage terminal. Now thankfully still available to divers, it is recommended to access it by boat, although a steel ladder is there to take adventurous divers from the shore to the water. 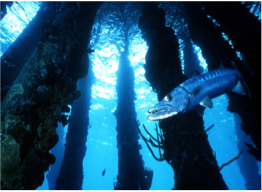 WIth a depth ranging from 20 to 80 feet (6 to 25 metres), expect to come across large schools of barracuda, among other marine life. Found southwest of Kralendijk, this relaxing beach offers divers the opportunity to encounter turtles and rays right from the sandy shallows, making it an ideal site for beginners and snorkelers. Depth ranging from 20 to 80 feet (6 to 25 metres). With a beautiful coastline to explore and marine wildlife to discover, boating is a popular activity in Bonaire and one that can be enjoyed via the many operators dotted around the island, whether you’re looking to rent your own boat, take a snorkelling excursion to Klein Bonaire, or hop on a glass-bottom boat tour. 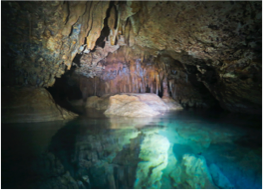 Counting over 400 caves, Bonaire’s underground network is a vast landscape of thousand-years old stalactites and stalagmites offering a fun exploration of the island indramatic settings. The caves can be visited with the assistance of a certified and experienced guide, and often feature a mix of crystalline fresh and salt waters that visitors can snorkel in. The calm waters that surround the island makes of Bonaire a great place to be explored by kayak. 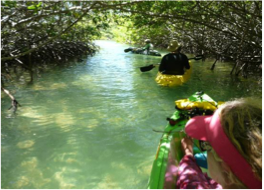 Amongst the recommended trips are Lac Bay and the mangroves located on the windward side of the island, all offering the opportunity to get close to and observe the local wildlife. On the leeward coast, kayaks can be rented from most diving shops and offer an alternative view of the coastline, with the opportunity of visiting Klein Bonaire. Take on a new challenge by stepping away from the perfectly shaped greens and slopes of the usual golf courses at Bonaire’s only golf course. Piedro So is a one of a kind experience that has one goal in mind: preserving the ground’s natural state. As a result, this 18-hole course is perfectly shaped into its surroundings, giving it a unique eco feel that golfers won’t find anywhere else. Keen kitesurfers will find Bonaire’s best kiteboarding spots on the island’s southwestern tip, with ideal year-round conditions. Kiteboarding lessons are also widely available for novice and beginners. One of the best way to explore the island is obviously by bike! With rentals available from hotels, bike shops, and operators, whether you’re looking to join one of the popular tours, or to explore Bonaire’s bike paths on your own (marked by blue painted rocks), cycling around the island’s many points of interests has never been so easy. Popular tours include Washington Slagbaai National Park, Kralendijk, and Rincon. Active travelers will be delighted by the stunning scenery Bonaire has to offer, including the hiking and walking trails of the island’s famous Washington Slagbaai National Park, where adventurous visitors will also enjoy a bit of climbing, rewarding them with breathtaking views of the surroundings. The island’s national parks generally offer guided tours too. 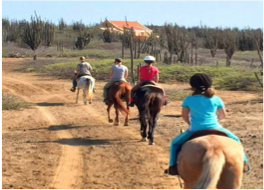 Whether you’re looking for lessons or an alternative way of exploring the island, you will find horseback riding facilities at the Rancho Washikemba (eastern side) and at the Horse Ranch Bonaire (western side), providing lessons and tours for riders of all levels. Great windsurfing conditions can be found on the eastern coast of Bonaire, particularly at Sorobon, in Lac, which offers warm shallow waters, constants wind, and sunny weather. Recognised as one of the world’s best places for windsurfing of all levels, the island counts several award-winning professional windsurfers and often ranks highly in international competitions, some of which it regularly also hosts. Lessons for all levels are also offered at Sorobon’s Windsurfing Professionals. If you like the idea of a fishing trip whilst on holiday in Bonaire, you will find many operators offering fishing trips and packages or, if you prefer, simply rent a small boat and organise your very own fishing day! A favourite destination amongst birdwatchers, the island counts more than 300 species of birds ranging from shore birds, land birds, and sea birds. Bonaire’s best bird watching spots can be found at Pekelmeer, at the Washington Slagbaai National Park, for a chance to spot the island’s very own yellow-shouldered parrot and parakeet, but also at Goto Meer, where the shy and sensitive flamingo can be spotted. To inject an extra dose of adventure to your Bonaire holiday, the island has cliffs to climb up and rappel down. Although Bonaire doesn’t abound with high mountains, climbers will enjoy its limestone walls, perfect for this activity. For an easy climb with breathtaking panoramic views, head to Brandaris Hill, located within the Washington Slagbaai National Park. With her products available in most supermarkets and restaurants, chances are that you will come across Aletta’s products during your stay on Bonaire - lookout for Aletta’s Semper Kontentu Goat Cheese! Here you can take a tour of the farm, pet the goats and learn about the cheese, yoghurt, and milk making process of this 100% Bonairean product. 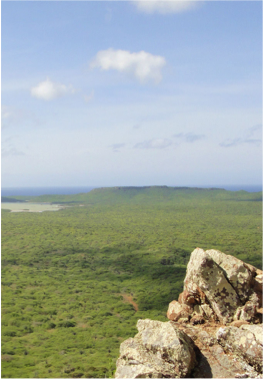 Situated in the Washington Slagbaai National Park and rising at 241 metres (784 feet), Brandaris is Bonaire’s highest peak. The medium-level 45 minutes Subì Brandaris Trail takes hikers to the top of the peak where they get rewarded with breathtaking views of the island and its surrounding, including Curaçao and, on a very clear day, Venezuela’s Santa Ana Hill, in the Paraguanà Peninsula. Built in 1824, this site is the island’s second oldest stone building, and was used by the Dutch Government to store provisions for slaves. Mangazina di Rei is now part of a cultural park where islanders strive to maintain their heritage through a succession of small traditional houses immortalising the Bonaire’s past. Believed to be the work of the Arawak Indians, and to date back to the 15th century, these red pictographs are found on the northern side of the island, on a 3-foot limestone ledge directed by small sign posts. Taking its name from the Dutch word for “salt lake”, Pekelmeer is one of only four sites in the world where flamingos breed. Located at the southern end of the island and counting over ten thousand flamingos, the sanctuary is not open to the public, but can be observed with binoculars from the road or from neighbouring Pink Beach. Other bird species such as herons, ospreys, cormorants, and frigate birds can also be spotted. Located at the heart of the island, this scenic lookout point offers beautiful views of Kralendijk and Klein Bonaire. At the top of the Seru Largu (translating as “large hill”), you will find a small monument with an inscription reading “Kristu Ayera Awe Semper”, Papiamentu for “Christ, Yesterday, Today, Forever”. On New Year’s Eve, the site is full of locals and tourists gathering to celebrate and watch fireworks. Located in Kralendijk, in one of the island’s few remaining historic building, this historical and archaeological museum features exhibits, artifacts, and tales covering 7,000 years of Caribbean and Bonairean history. Grab a pair of good shoes and head to the Bara di Karta water well, where this hike begins. A 150 metres walk up a slight hill leads you to a 10 minutes climb that rewards you with panoramic views of the island, with Kralendijk and Klein Bonaire to the West, and Lac mangroves, the saltpans, airport, and the lighthouse Cave to the East. A great vista point encompassing the various typical landscapes of Bonaire. Created in 1993 by Dutch spouses Marina Melis and Ed Koopman, this sanctuary was established to care for and offer shelter to the wounded and abandoned donkeys of the island. Counting over 400 donkeys, the sanctuary also works to raise awareness about the friendly animal, through educative and interactive programs aimed at locals and visitors. Located about half a mile from Bonaire at its closest point, this 1500 acres large uninhabited island was more than once saved by the locals from being developed. After the last development attempt of 1995, the Foundation for the Preservation of Klein Bonaire (FPKB) was created in order to protect the island and, amongst other official bodies, led the government to purchase the island. Nowadays, Klein Bonaire is under the protection of the Bonaire National Marine Park, and is an important turtle nesting ground. Located North of Lac Bay, this traditional kunuku house restored by its owner aims to educate locals and tourists about the island’s heritage by immortalising authentic kunuku living at the heart of an unspoiled terrain. Built in 1850, these huts were used as sleeping quarters for the slaves working in the salt ponds. Each week, the workers would collect and ship the salt - the island’s most exported product at the time - before walking seven hours back to their family Rincon on the Friday afternoon, to then return to the huts two days later. Situated on the northern tip of the island, this 14,000 acres park is composed of two former plantation estates, Slagbaai and Washington, which once supplied salt, aloe extracts, divi-divi pods, goats, and charcoal destined to be exported to Curaçao and Europe. Located on the road to Rincon near Trai Montaña, these gardens showcase how to grow plantations, herb gardens, medicinal gardens, and permaculture in a desert terrain. Located in Kunuku Dos Pos, a 30 minutes-drive from Kralendijk, this conservation centre focuses on the protection and rehabilitation of the endangered Yellow-shouldered Amazon Parrot. Join the weekly tour, taking place at 4.30pm on Wednesdays, to meet and learn about the rare bird and Echo’s work to rescue it. Located on the northwestern end of the island, this salt lagoon is a flamingo hangout where the shy bird can be observed mostly between January and June. Whilst there, make the most of the site’s vistas by walking up the paved road through the cacti jungle, leading to the observation area that overlooks the lagoon and the Washington Slagbaai National Park. Stretching over 700 acres and part of the Bonaire National Marine Park, Lac is the ABC Islands’ largest lagoon, and was recognised as a wetland of significant importance under the Ramsar Convention in 1980. Lac is composed of two peninsula, Cai and Sorobon, is bordered by mangroves and a barrier reef, and is home to endangered species including the Queen Conch, Green Turtle, and mangrove trees. Once the object of wars and disputes between European nations, the salt industry saw its decline with the abolition of slavery in 1863, until revived by a US company in the 1960s. Nowadays, Bonaire’s thriving salt industry can be spotted on the southern side of the island, where the big crystal mountains dominate the landscape. The Salt Company land is also home to a Flamingo Reserve which, although closed to the public, can be observed from the road. Home to the Cadushy of Bonaire Liqueur, the world’s only liqueur made of cactus, this distillery invites you to learn about the process of making their unique products and the chance to sample them at the end of your visit.